“Good King Wenceslas looked out, on the Feast of Stephen…” and so did Dottore Gianni! In fact he not only looked out, he stepped out and up, to Hradcany, the Prague Castle complex. While I’m on it, who is St. Stephen? Well, apparently not only a saint and martyr, but the FIRST martyr, tried and stoned to death for preaching about Jesus only a year or so after the crucifixion. 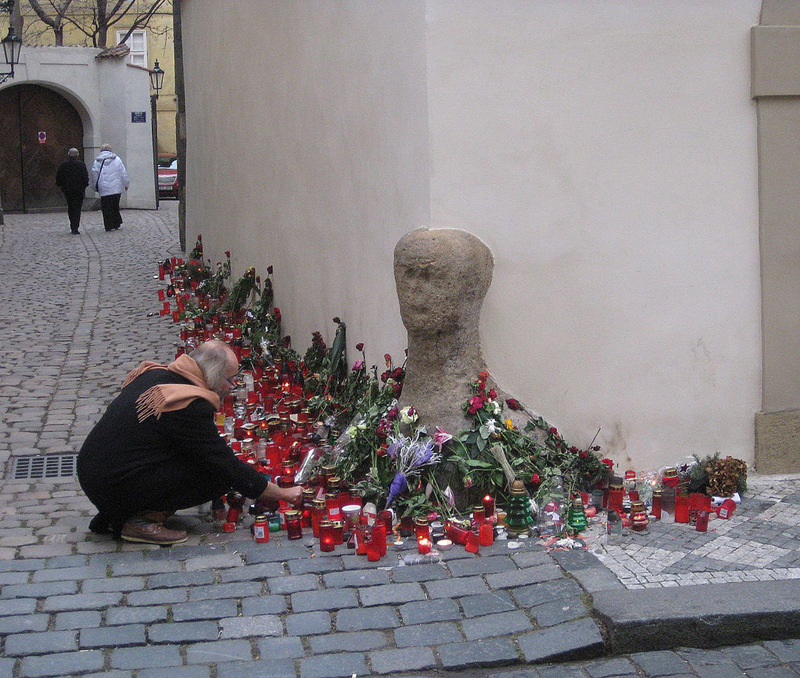 Several Catholic countries observe an actual holiday on 26 December in honor of this first martyr, including the Czech Republic. He is known as Istvan in this part of the world. If you remember back to my Budapest post, the beautiful St Stephen’s Basilica in that city (Szent Istvan Bazilika) is named after him. Knowing that a Bohemian duke named Wenceslas was out giving alms on a cold day in December, a day holy to him and those around him (except possibly for his assassins) because it honored the first Christian martyr puts the story and the hymn in context for me – whether it does so for you or not, sorry! Whew! I DO go on! 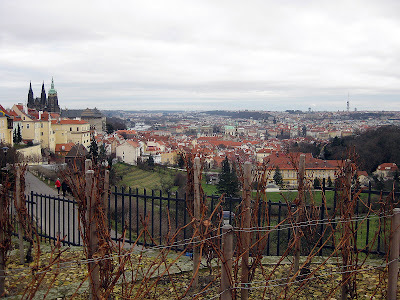 So on the Feast of Stephen I ventured out and climbed to the castle via Mala Strana. 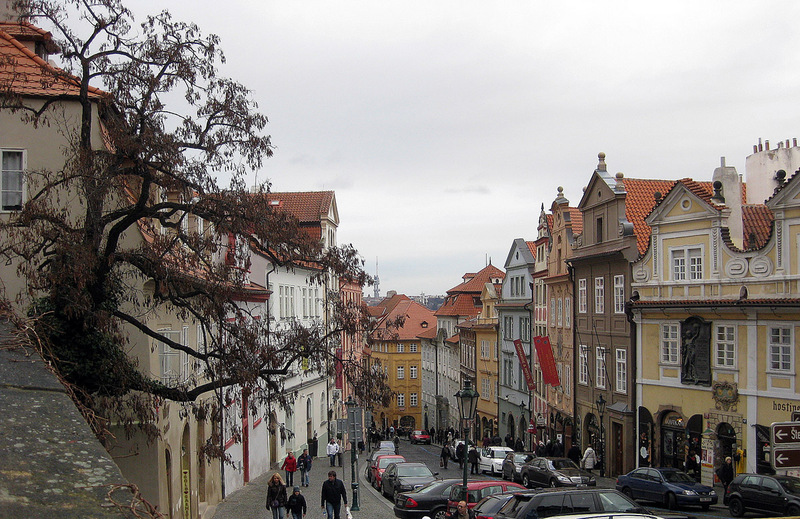 If you start in Malastranske Namesti it’s a fairly steep but manageable climb along a street filled with cafes, restaurants and more than anything else, souvenir shops, so if you get tired there are plenty of places to get your breath back again. The day was not completely clear, but enough so that once in the area of the castle it was really quite lovely. I decided to go a bit farther on, as I’d not seen the Strahov Monastery, slightly higher on the hill than the castle. 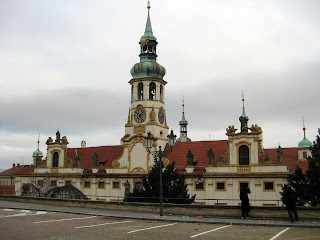 If you’re ever in Prague and at Hradcany already, there are two good reasons besides seeing the monastery to go. First, the views from a terrace at the rear of the monastery the views are even more breathtaking than those from the castle. Second (and more fun), the good monks of Strahov still brew their own beer, several variations in fact, and there’s a little café next to the monastery where I had a really good chicken noodle and vegetable soup (though not so fine and like my grandmother’s as I’d had in Bratislava) and a decent amount of the monks’ amber ale – delicious lunch! Thus fortified I strolled easily back to the castle, passing Loreto on the way. My mother, sister and I had visited there those several years ago when we took our trip to Prague. I didn’t go in this time, but it’s famous for a copy of the house in Nazareth called the Santa Casa, where the annunciation took place. 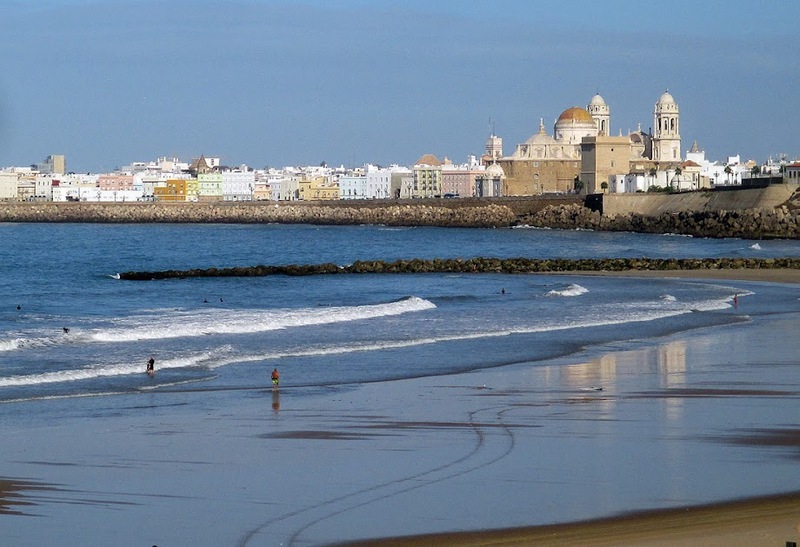 It’s referred to as Loreto because in the late thirteenth century a wealthy Italian family bought the house and had it brought back to their home town…Loreto. 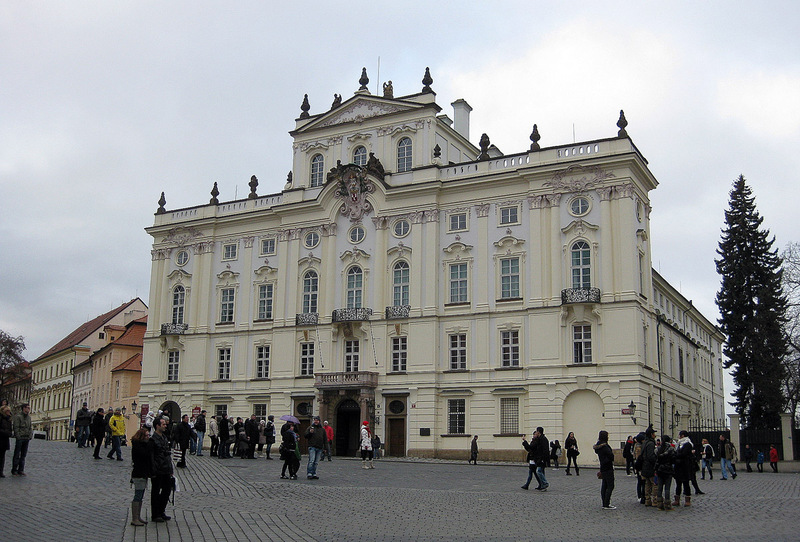 Even though the Prague Santa Casa is a mere replica, it seems the place has become a pilgrimage destination as well as a tourist attraction. and finally went through the castle gates and into the courtyard where everyone who enters is overwhelmed by the St. Vitus Cathedral. The cathedral is overwhelming from much farther afield, in fact to my mind it is THE highlight of the view from Charles Bridge, for example, or any other place along the river where the complex is visible. Think about it for a moment. If you erased St. Vitus from the photos we all take of Hradcany, what would the view be? A group of buildings high above you, but none so distinctive, so dramatic as the cathedral, which is THE focal point. Agreed? Of course, I knew you would! 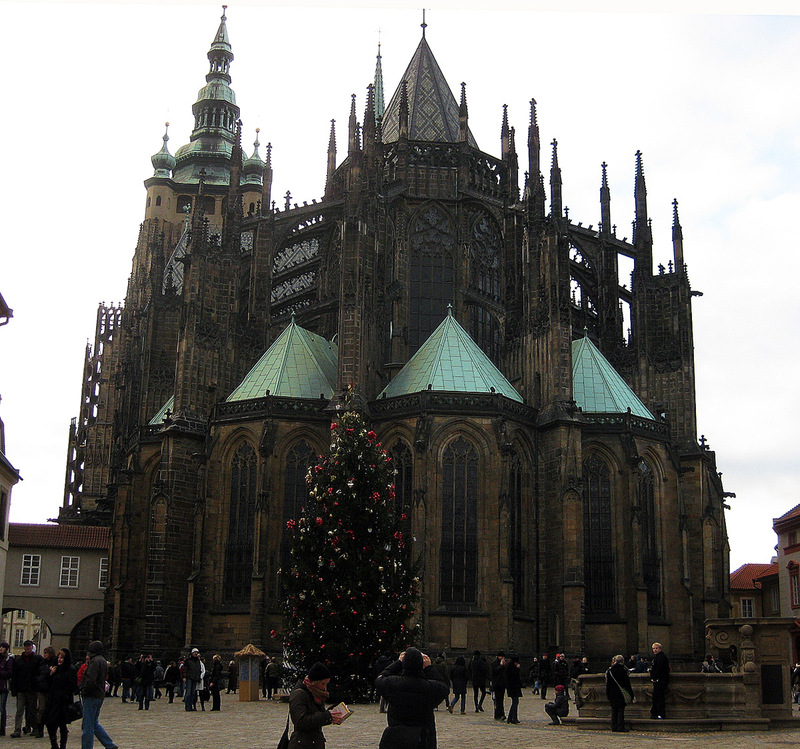 St Vitus Cathedral - flying buttresses! 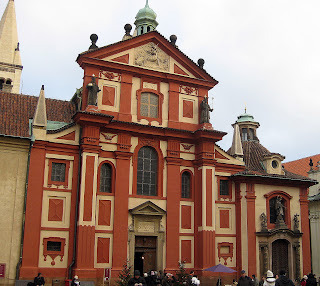 The Basilica of St George, the oldest church within the castle, founded in 920, rebuilt after a fire in 1142, and Zlata Uliska (Golden Lane) filled with tiny houses dating from the fifteenth century, one of which, number 22, Franz Kafka lived in for a time. 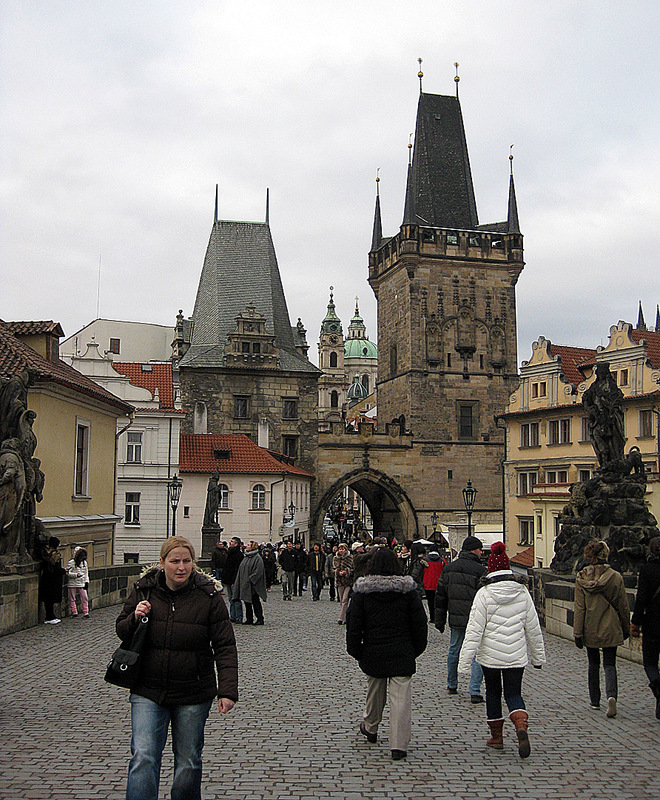 I had been to all of these before, but I wanted to stroll through each again, as who knows when, or if, I’ll make it back to Prague? 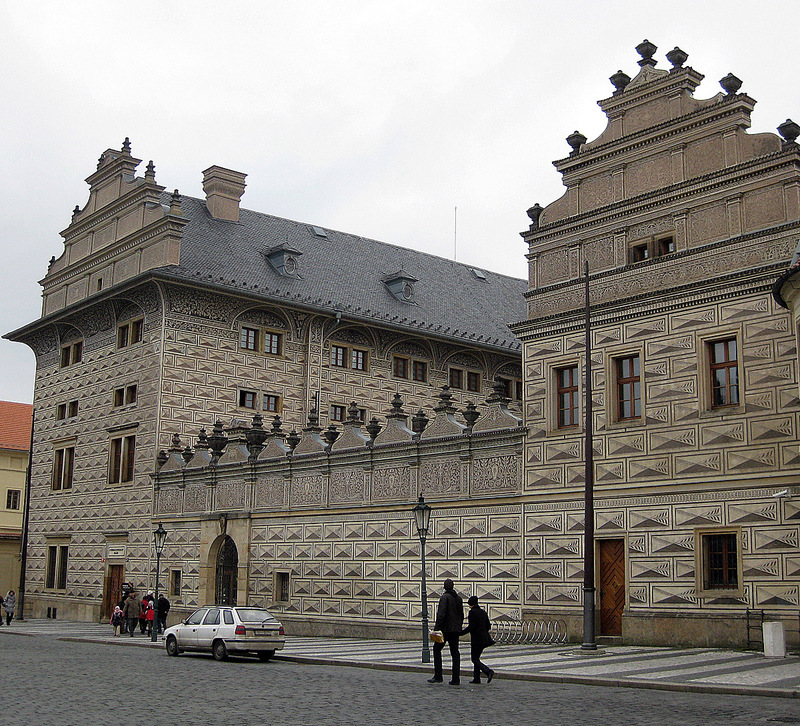 Then I headed back down to Mala Strana, crossed the river one bridge north of Charles Bridge which leads directly to the Rudolfinum, an elegant neo-Renaissance structure in Stare Mesto. The Rudolfinum houses antiquities, art, and is home to concerts of classical music, as are so many public buildings in Prague. It had been a busy and relatively long day, so I headed back to Wenceslas Square, had some halusky at the Christmas Market there (potato gnocchi with bacon and cabbage – not as good as I’d hoped) then returned to the hotel where I ended up doing as I tend to do at the end of the day – dealing with photos and preparing blog posts. My final day in Prague was a rather light one, comparatively, as I had beem active, maybe too much so, during the first three. 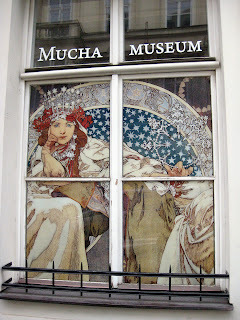 After another good breakfast I headed to one of my favorite places in Prague, the Mucha Museum. Alfonse Mucha was a talented artist from Bohemia, who created a sensation in Paris when he deigned a poster for Sarah Bernhardt, the greatest actress of her era. The style in which he designed it was unique, and was for a time known as the Mucha style, but later became known as Art Nouveau and grew into a popular form throughout Europe and beyond.. 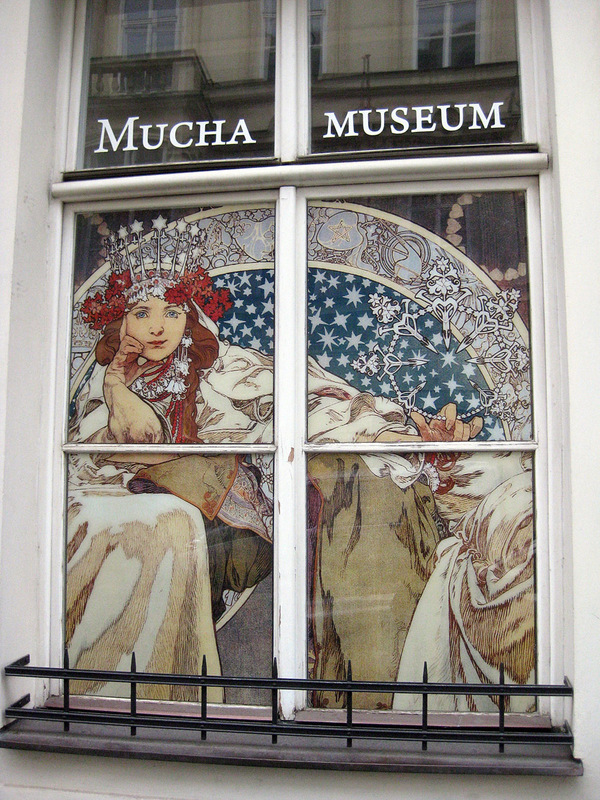 The museum is excellent, and at the end of your tour of it you can see a twenty-minute film on Mucha's life, very well done. I left the happy but hungry, and found a small cafe in Stare Mesto where I had an inexpensive, delicious bowl of goulash soup, very different from that which I had had in Hungary. I then decided to walk north through the old town to Josefov, the Jewish quarter. In this part of town I came upon a unique statue of Kafka, which I'd not seen before, as well as the Spanish and Old/New Synagogues and the graveyard next to which souvenir stands sell among many other things, books and other gifts that have to do with the Golem of Prague -- legend has it that a rabbi created this colossus out of clay to defend the Jews of the city and to prevent pogroms. The Golem became more and more violent, in one version of the story it fell in love, and ultimately the Rabbi had to de-commission his creation -- but some say it is still in the attic of the Old/New Synagogue, waiting to be re-activated if need be! 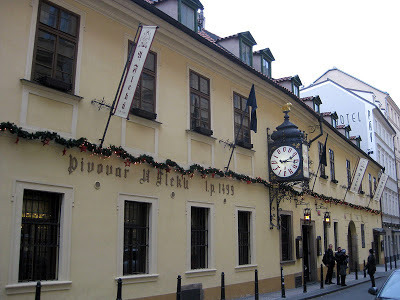 For one of my final acts in Prague I fulfilled a promise to David Agranov, who had arranged for the great room I stayed in while there: to go to U Flecku, the famed pivnice and restaurant to have one of their home-made brews. I did, in fact I had two -- one for David, another for me. 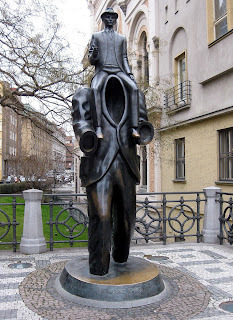 Another special Prague treat, upon entering your are seated at a long thin table packed with other tourists and regulars. A beer is brought to you on a platter with many others, a small sheet of paper is placed next to you on the table and a mark is made to signify what you owe. Glasses of the powerful Becherovka are also brought round, and of course you can order food if you like -- a warning: it's OK to smoke there and there was a lot of smoking foing on, which would probably ruin the experience for some, but it's quite the place, and their pivo is near perfect! Then I staggered back to the hotel, made sure that the lovely and delightful young woman at reception ordered me a taxi to the airport for the next morning, and I also asked if she could print out my boarding pass, as I had been able to check in on line, but of course had no access to a printer. She jumped to the task and made my departure much easier. Then I headed out for a last meal, but I was so stuffed from Slavic food that, sacrilege of sacrileges, I ate Italian. A decent Margarita Pizza and a big salad, and a tad more red wine than I really needed. 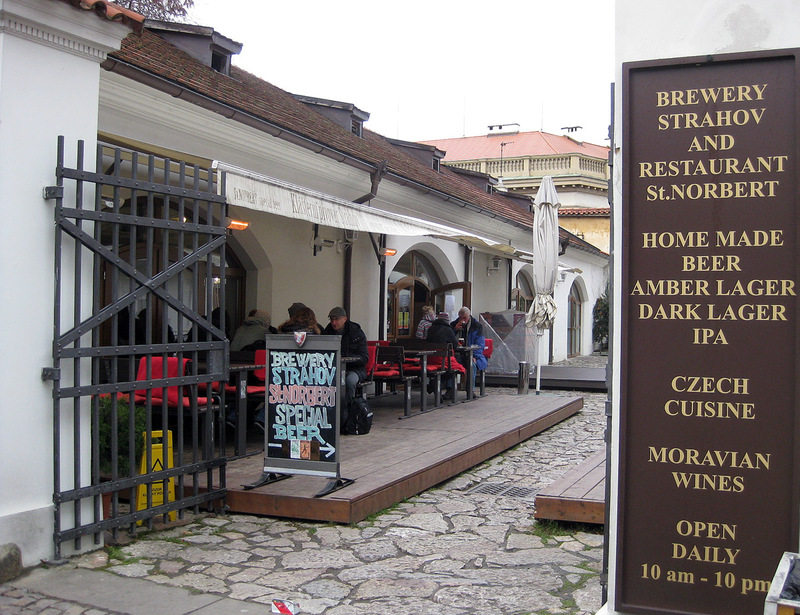 Little more to say – I really enjoyed my trip, not just to Prague, but to Budapest and especially Bratislava. I learned a lot, I saw two great cities I’d never seen and re-visited one I love, at Christmas to boot, a decorative and celebratory time in any part of the world, but the Christmas markets and decorations these cities seemed to propel me into the holiday spirit. 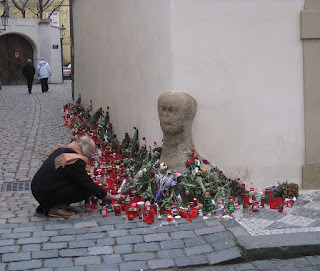 And maybe most importantly I was able to bid my own small adieu, with a votive candle, to a hero of mine, Vaclav Havel. Next trip in just a few weeks, for my birthday – Bruges!